Durham, N.C. — The Durham County Sheriff’s Office on Sunday responded to social media backlash concerning the way they handled the possibility of a white supremacist rally in the city on Friday. Attorneys Scott Holmes, who is representing several protesters who were arrested last week in connection with the vandalism of a Confederate monument, and T. Greg Doucette took to social media to accuse the sheriff’s office of causing chaos and spreading rumors that a white supremacist rally would be held in the city. Hundreds turned out to march in response to the rumored Ku Klux Klan rally at the site of the vandalized statue, forcing the closure of several downtown streets and businesses for a large portion of the day. The demonstrations ended peacefully with no injuries, although on person was arrested at the Durham Police Department headquarters and charged with failure to disperse. Sheriff Mike Andrews took to Facebook on Sunday, stating that deputies shared the rumors of a white supremacy rally with “key individuals” and community leaders as a precautionary measure to avoid the possibility of groups with opposing viewpoints clashing. “Sharing that information with key individuals, including a representative of demonstrators who were staged outside the courthouse Friday morning, was in no way a signal for them to independently sound the alarm ahead of law enforcement, potentially triggering needless panic and anxiety,” Andrews wrote. “Had my office never said a word and the Klan never arrived, it would’ve been a normal Friday in the Bull City. Had it never given key leaders advanced warning and the Klan arrived, my agency would’ve been criticized for being silent with prior knowledge, albeit unverified,” Andrews wrote. 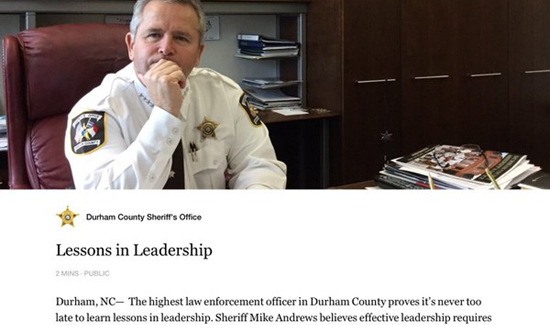 Andrews stated that while the sheriff’s office is aware of the complaints posted to social media, none of those who posted have reached out directly to share their concerns or seek further explanation.